Factory style 2-Piece Top with Window. Included with the Top, Wire-On trim & Chrome ends to hide the Staples above rear window bow, also included, Matching Top material to use for front Header-seal (front Header-seal is not the front Rubber seal). This Mustang Convertible Top for the Ford Mustang (GLX, GT, L, LX) fits the 1983, 1984, 1985, 1986, 1987, 1988, 1989 and 1990 model years. You can buy Convertible Top with Window which includes the main Top Cover section & the Window section, or you can buy Convertible Top with Window Kit which in addition to Top & Window sections also Includes Top Pads, Side Cables & Tacking strips. Other colors can be ordered, please inquire. We offer Factory style replacement Front Convertible Top Cover section only, Factory Style Replacement Rear Glass Window section only & Non-Original style Rear Plastic window section only. If you buy Top only, you will only receive the front section of the Convertible ready for installation, includes Wire-On trim to hide staples & assembled front header seal. You will not receive window or materials related to the window section. If you buy Window only section, you will receive a new window laminated to a new material known as window curtain ready for installation. You will keep your existing Top cover. No Wire-On trim nor assembled front header seal included. Mustang Convertible Top Pads are made with special Black heavy duty Topping material, also includes Quarter Pads. You can re-use your existing Top Pads if they are in good shape. Top Pads sold as a set, buy one order per car. 83 thru 90 Mustangs came with 3 different size cables from factory, please measure your existing Cable and choose accordingly. You can re-use your existing Top Cables if they are in good shape. Cables sold as a set, buy one order per car. This Ford Mustang Convertible Top Installation video provides detailed instructions on how to install your Ford Mustang Convertible Top. It is produced by a 3rd party and offered through TopsOnline for our customers, in DVD format. If you are purchasing a convertible top from this page, you will have the option to purchase this DVD at a discounted rate with your convertible top purchase. 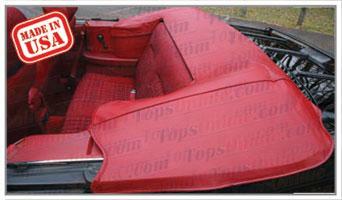 This Mustang Convertible Top Boot Cover is made with original Sierra textured expanded Vinyl material. Other colors can be ordered, please inquire. 83-89 Mustang Boot Cover attaches with 6 Snaps (3 on each side) & Plastic slider, 6 Snaps and Plastic slider are installed on the Boot Cover. 1990 Mustang Boot Cover attaches with 8 Snaps (4 on each side) & Plastic slider, 8 Snaps and Plastic slider are installed on the Boot Cover.